If you write speculative fiction, do you write the world as it is, or the world as you wish it to be? We need both kinds of stories out there. You might do one or the other, or you might do both, even within the same story. Just know you'll get criticized for it either way. (2) LIBRARY OF CONGRESS HIGHLIGHTS WOMEN ILLUSTRATORS. The Washington Post’s Michael Cavna, in “Undersung women illustrators get their due at Library of Congress exhibition”, reports on a Library of Congress exhibition featuring such significant women cartoonists as Dale Messick, Lynn Johnston, and Lynda Barry. It is possible, in this era of increasing recognition of women artists, to gaze at the recent prize-laced success of Alison Bechdel and Roz Chast and Raina Telgemeier and Lynda Barry, to name just a few, and consider that the field of illustration is becoming more level along gender lines. But then you consider that only two women have ever won the Pulitzer Prize for editorial cartooning, or that The Washington Post runs only two comic strips created by women — and none by a woman of color — and you remember how much further the cause of women artists getting fair representation has yet to travel. That is a central thread running through “Drawn to Purpose: American Women Illustrators and Cartoonists,” the rotating exhibit of nearly 70 works now up at the Library of Congress’s Swann Gallery from its Prints and Photographs Division. “This show has been years in the making,” says its curator, Martha H. Kennedy, noting that her vision for “Drawn to Purpose” long preceded 2017’s shifting zeitgeist amid the #Resist and #MeToo movements. Here’s a link to the Library of Congress webpage about the exhibit. Features the rich collections of the Library of Congress and brings to light remarkable but little-known contributions made by North American women to the art forms of illustration and cartooning. Spanning the late 1800s to the present, the exhibition highlights the gradual broadening in both the private and public spheres of women’s roles and interests, and demonstrates that women once constrained by social conditions and convention, have gained immense new opportunities for self-expression and discovery. The exhibit, which opened in November, continues through October 20. (3) PAPERBACK SHOW. 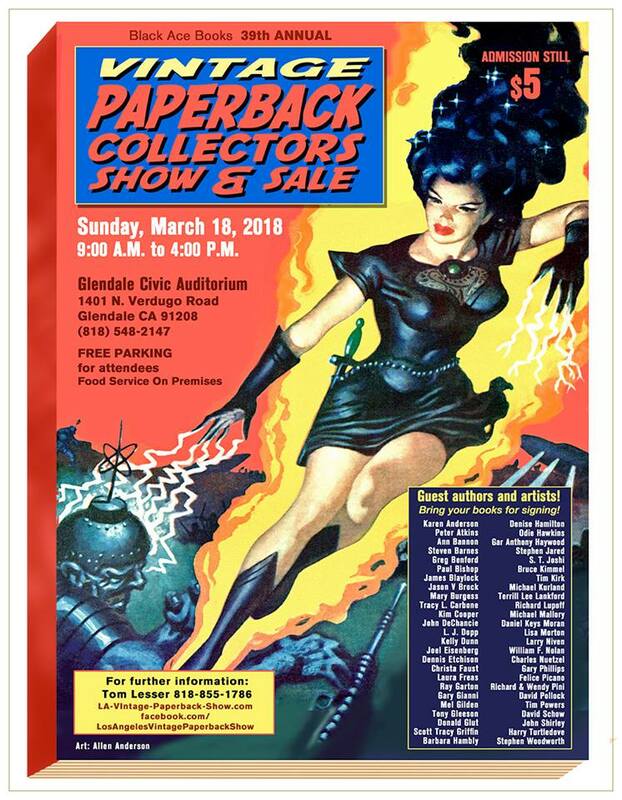 Here’s an updated poster for the 2018 Vintage Paperback Show with the names of participating writers and artists. (4) BY THE NUMBERS. Here’s an ambitious project – Ross Johnson gives us “Every Episode of Black Mirror, Ranked” at the B&N Sci-Fi & Fantasy Blog. The always-great J.K. Simmons stars in this scifi thriller about a pencil-pusher who realizes the government agency he’s working for has long been concealing the existence of a parallel dimension. Things get really odd when his double (a badass secret agent) pops up in his world and enlists him to help catch a killer who’s also slipped in from the other side. Legion’s (the Marvel mutant, not DC’s L of Super Heroes (1)) first season was incredible. Halfway through that season, I thought they were going to go yukky-horror, but happily that’s not where they went. Yes, it’s a Marvel mutant, but no, this isn’t a mutant or superhero show per se, more like Number Six’s Last Year In Marienbad. (6) ANTIQUE COOLTH. Gotta love this. (If you’re a geezer.) 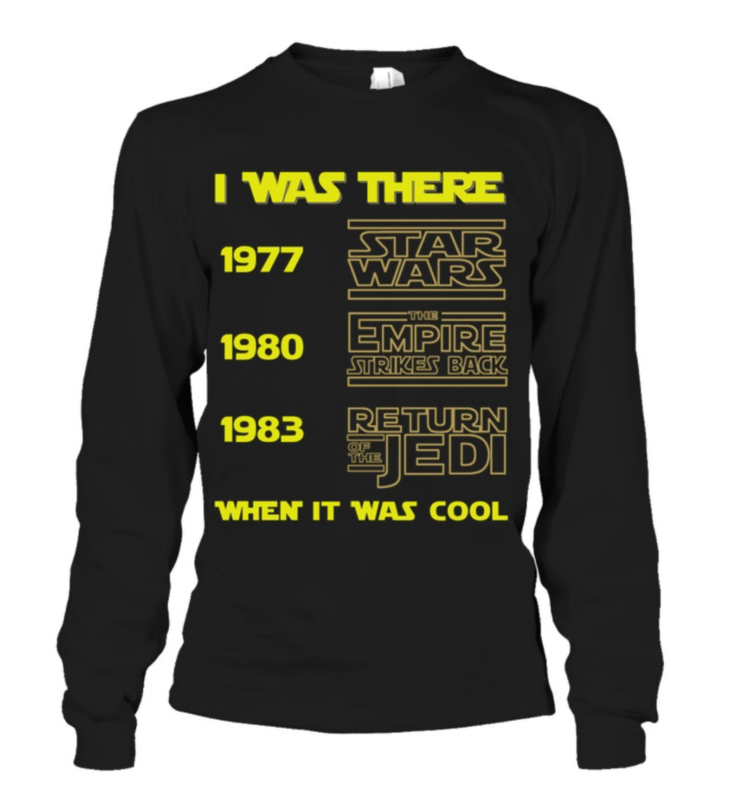 “I was there when it was cool”. (7) NO SPECTRUM FANTASTIC ART LIVE IN 2018. John Fleskes, Cathy Fenner, Arnie Fenner announced on Facebook that they will not be holding a convention in 2018, however, there will be a Spectrum Awards ceremony. We have (understandably) been receiving a number of messages and emails inquiring about the 2018 dates for Spectrum Fantastic Art Live. While we have worked diligently since the close of the 2017 show last April to come up with something workable this year, we, unfortunately, were unsuccessful. Kansas City is an increasingly difficult venue to find acceptable show dates; we’ve felt lucky to have been able to squeeze in when we could in the past (realizing, of course, that any dates we used put SFAL in conflict with other conventions artists like to attend). With a new downtown convention hotel in the works and a new airport approved by voters, dates in Kansas City will continue to get harder to come by in the future rather than easier as more—and bigger—shows move into the area. The dates, spaces, and hotel prices that were available to us this year simply didn’t work for the vision we have for SFAL. Reluctantly we’re announcing that there is no Spectrum Fantastic Art Live convention planned for 2018. However, there IS a Spectrum 25 Awards ceremony in the planning stages for May 2018: we are working with Baby Tattoo’s esteemed showman Bob Self on something pretty wonderful. We’ll be making an announcement once details are finalized in the coming weeks. But what about another SFAL? Well, we’re working on that, too. This hiatus is allowing us to rethink the model for an artist convention/fair. While we’re extremely grateful to the 2000+ supporters who turned out for SFAL in Kansas City, we recognize that we were falling short of the event’s potential. Being unable to break through that attendance ceiling has prevented us from achieving the goals we have for the show and community…. Certainly, the social and networking opportunities of any convention or gathering are extremely important—but so are the finances for all. SFAL was never set up as a profit-generator for us, but it has to pay for itself and to provide a reasonable return for exhibitors. Spending time together is always an emotional plus, naturally, but artists paying for their own “party” while an organizer pockets their cash isn’t—and will never be—our purpose. Growing the market and giving the Fantastic Art community the public recognition it deserves are what SFAL, like the Spectrum annual, have always been about. (8) UP ALL NIGHT. From The Guardian, “Buy a cat, stay up late, don’t drink: top 10 writers’ tips on writing”. (9) STEUER OBIT. Jon Paul Steuer (March 27, 1984 – January 1, 2018), known as the first actor to play Worf’s son Alexander Rozhenko in Star Trek: The Next Generation, is dead at 33. January 5, 1950 — The Flying Saucer opened theatrically. Born January 5, 1914 – Superman actor George Reeves. (12) BLACK PANTHER. Capitalizing on the new film, Marvel will release Black Panther – Star Here, a FREE sampler, on January 31. 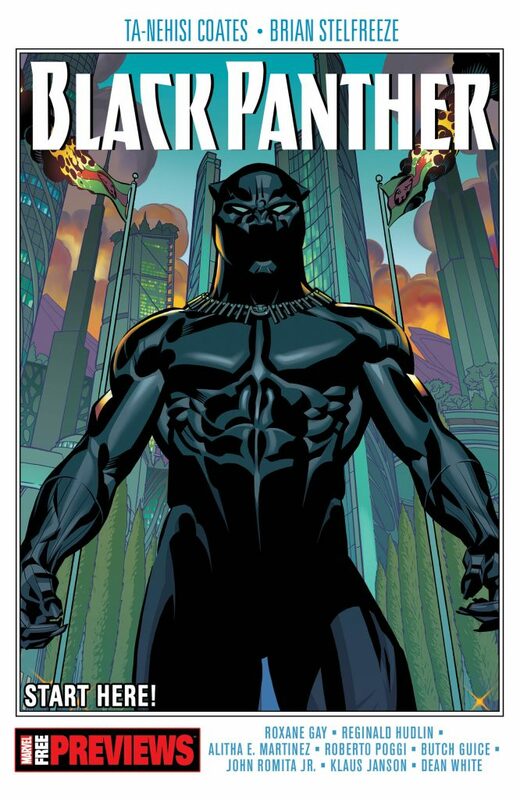 Featuring excerpts from Marvel’s current Black Panther ongoing series, as well as World of Wakanda, Black Panther and the Crew, and portions from Reginald Hudlin and John Romita Jr.’s Black Panther run, BLACK PANTHER – START HERE serves to introduce brand new readers to the character’s expansive 50-year Marvel history, while long-time fans will be able to relive some of T’Challa’s most epic adventures. Journey to where magic and myth began! Join us in October 2018 for “Harry Potter: A History of Magic”, a British Library exhibition. New-York Historical Members can reserve tickets starting February 14 at 12 pm. Tickets go on sale to the general public in April. Capturing the traditions of folklore and magic at the heart of the Harry Potter stories, Harry Potter: A History of Magic unveils rare books, manuscripts, and magical objects from the collections of the British Library, New-York Historical Society, U.S. Harry Potter-publisher Scholastic, and other special collections. Visitors can explore the subjects studied at Hogwarts and see original drafts and drawings by J.K. Rowling and Harry Potter illustrators Mary GrandPré and Jim Kay. Harry Potter: A History of Magic is currently on view at the British Library in London through February 28, 2018. September 2018 marks the 20th anniversary of the U.S. publication of J.K. Rowling’s Harry Potter and the Sorcerer’s Stone, following the 20th anniversary celebrations of the publication of Harry Potter and the Philosopher’s Stone in the U.K. in 2017. (14) RELIC OF MIDDLE-EARTH. The New York Times, in “The Hero Is a Hobbit”, has unearthed W.H. Auden’s review of The Fellowship of the Ring from 1954. Seventeen years ago there appeared, without any fanfare, a book called “The Hobbit” which, in my opinion, is one of the best children’s stories of this century. In “The Fellowship of the Ring,” which is the first volume of a trilogy, J. R. R. Tolkien continues the imaginative history of the imaginary world to which he introduced us in his earlier book but in a manner suited to adults, to those, that is, between the ages of 12 and 70. For anyone who likes the genre to which it belongs, the Heroic Quest, I cannot imagine a more wonderful Christmas present. All Quests are concerned with some numinous Object, the Waters of Life, the Grail, buried treasure etc. ; normally this is a good Object which it is the Hero’s task to find or to rescue from the Enemy, but the Ring of Mr. Tolkien’s story was made by the Enemy and is so dangerous that even the good cannot use it without being corrupted…. Don’t agree with Larry about everything, but when it comes to WorldCon and the Hugos, I think he’s got a point or two which are, based upon my experiences with WorldCon, difficult to refute. The choices made by various folks involved with WorldCon have, over time, convinced me that there’s quite a few more less-than-nice people there than at other conventions. As I get older, my remaining time gets increasingly valuable. If I went to WorldCon, that’s a weekend I could have spent with some of the many wonderful people in my life, or with excellent and nerdy readers who don’t much care about politics and just want to do fun nerd things. Or I could have spent that time writing. There’s probably a lot of perfectly wonderful people helping with WorldCon, and there’s certainly a lot of nice people attending. But it’s sort of hard to see them through the crowd of ugly-spirited jerks, and the nice people of WorldCon? They are completely inaudible over the noise the jerks are making. So for the kind people at WorldCon, I hope you catch me at another con or signing sometime, and thank you so much to those of you who buy my work. To the jerks, may you meet no one who displeases you, and I hope that your con goes exactly the way you want it to go. (16) WHEN WAS THE FUTURE INVENTED? Can’t find a record of linking to this when it came out – Adam Roberts’ essay “Till Tomorrow” in The New Atlantis. So this future, the one Gleick is talking about, is a quite recent technological invention. There is a peculiar irony here: Gleick, who scolds Shakespeare for being stuck in the present, is so attached to our present ideas that when he encounters past views of the future he denies that they count as “the future” at all. If the difference were not framed so absolutely, Gleick would surely be on to something — nobody could gainsay the observation that, at the very least, stories about the future are very common today whereas a few centuries ago they were not. In the hands of a less breathless writer, this might have led to a more fruitful discussion about how our “temporal sentience,” as he puts it, differs from our ancestors’. But the larger claim is dotty. Can you really imagine any population of human beings living their lives wholly incurious about what next week, or next year, might bring, or thinking that it won’t be different? Think through the practicalities: How could anybody have planned anything, stored grain for the winter, calculated the interest on loans, or mustered armies, if the future truly were indistinguishable from the present? And this brings us to hunter-gatherers and farmers. It is certainly possible to imagine our hunter-gatherer ancestors living in some bestial, continuous present of consciousness, their experience of time pricked out with moments of intensity — the chase, the kill, the satisfaction of a full stomach — but indifferent to the distant future. But it is quite impossible to imagine farmers prospering in such a frame of mind. Once we humans began to depend on planted crops and domesticated animals, our new mode of life absolutely required us to think ahead: to anticipate setbacks and think through solutions, to plan, to map out the future world — indeed, many potential future worlds. Time travel as mental exercise must have begun at least that early. And that makes this focus on recent modernity look a little parochial. We are not so special. Indeed, thinking in this way of the future’s origins might make us rethink some of the metaphors we use to articulate our sense of time. Gleick is good on the limitations of these figures of speech — for example, time, as he shows, is not really “like a river.” Farmers, the original time travelers, are likewise prone to think of rivers not first as modes of transport but means of irrigation. Might time be the same for us — not a vehicle for taking us somewhere, as a horse is to a hunter, but a resource to make fertile what we have and hold dear? (17) MORE ON SWATTING. According to Vice, “Fatal swatting results in felony charges for gamer but not cop who pulled trigger”. Barriss has been charged in Kansas, though he’s being held without bail in Los Angeles. He’ll likely be out in Kansas to face trial by early February, according to the Wichita Eagle, and could wind up spending up to 34 months in prison. The police officer who allegedly pulled the trigger has not been charged, though Finch’s mother is calling for charges against the officer. “Justice for the Finch family constitutes criminal charges against the shooting officer and any other liable officers as well as damages against the city of Wichita for the policies and practices of its Police Department,” attorney Andrew Stroth, who is representing the family, told the Associated Press in a phone interview. The Wichita police department claims that Finch was shot after he came to the door and moved his hand toward his waistline. Police Chief Gordon Ramsay called the incident a “terrible tragedy,” according to TIME. (18) SOUND FAMILIAR? Curvature with Lyndsy Fonseca and Linda Hamilton, is a time travel drama about an engineer who travels back in time to stop herself from committing a murder.